Because you really can’t compare the internet opportunity in China and in India. The Chinese market is a walled garden of sorts, open mostly only to Chinese businesses — after all, Google, Facebook and Twitter haven’t been allowed to freely operate in China. So Baidu ended up being the Google of China, RenRen is the Facebook of China and Weibo is the Twitter of China. And even Amazon has faced a huge uphill task there. The Chinese have built their businesses without much global competition — that half-trillion dollar market cap came much easier, after much government protection. Sure Alibaba beat eBay — but that is one exception. There are significant regulatory, political and language barriers for non-Chinese internet firms to win in China. It’s the same in Russia. Yandex is the Google of Russia and vKontakte is the Facebook of Russia. While, in India, the regulatory barriers are almost non-existent, our internet is still mostly in English and our politicians aren’t able to control digital media companies like the Chinese and Russians can do in their countries. The result of our openness? The Facebook of India is Facebook, the Google of India is Google, and the Twitter of India is Twitter. And it’s just as likely that that Amazon — not Flipkart, will be the Amazon of India; that Uber — not Ola, will be the Uber of India; and that Tinder — not TrulyMadly will be the Tinder of India. And so on. This has a few implications. First — if you want to see the size of the Indian internet economy, you MUST include chunks of Google, Facebook, Twitter and others in it — because these are India’s leading internet companies. There are several ways to do it- one is to look at global revenues and market caps of these companies and attribute the Indian market cap to the share of Indian revenue in the global pie. I tried that, but came up across a big issue- not knowing the Indian revenues of many of these firms, because it’s not separately called out. I tried it a second way — to attribute the India-linked market cap to the Indian share of the firm’s global users — and that data was a little more accessible. I took all data from public sources like press releases, or estimates from SimilarWeb and the like. Wherever available, I took user or customer numbers (in regular font below) and where not available, I’ve taken traffic numbers (in italics below). And instead of private company valuations which would count Uber and such — I’ve taken more conservative public company valuations. Oh, and further, all mistakes are mine alone. The top 10 global internet companies have a combined market cap of over $1.3 trillion. But one can attribute up to $150 billion to Indian users. Yes, of course, there is a large caveat here. First that, as said before, the Indian share of global revenues will give a more accurate picture. 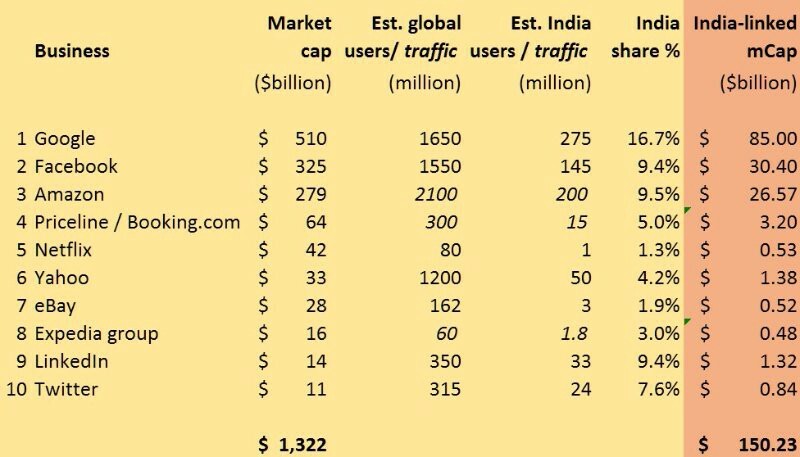 And our share of revenues will certainly be less than our share of traffic or users. So you can discount this number by 25%, 50% or even 75% to adjust for that — but the final number is still significant. Though I do think market caps are not just a function of revenues — user base is also a prime consideration — after all that’s where the growth will come from. Now if you add the $30 billion or so of market cap of our local unicorns to this $150 billion, we’ll end up with around $180 billion of market cap for our current Internet economy. Then, adjust for the fact that China has 720 million internet users and India has exactly half, 360 million users. $520 billion of Chinese market cap per head across 720 million users is $722 per user. Our number turns out to $180 billion of market cap across 360 million users — or $500 per user. So the real difference between the Chinese internet potential and Indian internet potential is not 10x or 15x — but perhaps closer to 40% or 1.4x. Or you can be pessimistic and call it 2x if you like. But 10x it isn’t. First that there just isn’t as much headroom for growth in the broad internet economy for startups in India as you’ve been told there is. The $180 billion may grow over a few years to $300 billion — but $200 billion to $250 billion of that will accrue to non-Indian firms. Leaving $50 to $100 billion for Indian startups. Please adjust your expectations accordingly. So a more apt way of looking at the Indian potential is to see us like the 51st state of the US. Or like a United Kingdom. Large market for global companies — not necessarily a large market for local firms. So I’d say much of the growth assumed for our current unicorns is probably vastly over-estimated. Especially if the Indian unicorn has global competition in its way. Second, the nature of Internet businesses is largely a winner-take-all in any niche. If you see the market share that Google ended up with in search, Gmail in email, Facebook in social networking, Twitter in microblogging, YouTube in video etc — they’re all well above 80%. So if you take on a niche — you either end up the leader with 80% of it, or a distant number 2 with 8% of it or a non-player with 0.8% of it. This is where the chips largely tend to fall — though there are a few exceptions. So your likely playbook if you take on a global internet company are (a) to be bought by the global player or (b) to end up eventually as the 8% play. So what’s going to happen to Flipkart now that Amazon and Alibaba have declined to buy it? Or to Ola now that Uber has declined to buy it? It may not be the nicest of news, I believe. Which leads to the third take-away. If you want to build a large Internet business in India — then do it out of the way of the globals. Build something where the globals aren’t. From my own portfolio, I’d suggest that RedBus, CarWale, MyDentist, Chumbak and others have picked the right areas. Other firms like InMobi, Naukri and PayTM are on paths outside the globals’ footprints too. This is a good place to be, over the long term — unless you’re sure you can sell out to a global like Baazee did to eBay. I personally believe this is extremely risky — as the global firm may just turn around and say “nope, I’ll build it myself” as many are increasingly doing so. In other words — try not to be the X of India. Try to be the yourself of the world. This is easier said than done, both because we have a long entrepreneurial history in India of building copy-paste businesses, from independence till now. And second, because most investors in Indian internet firms work for US or other firms who wrongly believe they can simply fund and build the “X of India” — and have some comfort in funding copy-pastes rather than backing originals. Even the copy-paste specialist Rocket Internet from Germany has failed in virtually every venture in India. Copy-paste just does not work in internet businesses in India. But I do see signs of this groupthink slowly giving way to backing original companies. And the fourth takeaway — is for these firms to go global too. Naukri has expanded to West Asia. Chumbak is in Japan. InMobi is all over. And we’ll do better to expand to 2nd and 3rd world countries than taking on the first world. Because the nature of our markets and products is typically more suited to those economies than to winning in the US. This is how you get long-term traction — do to local firms in those countries what the globals are doing to us. Is this bad news for Indian internet startups? Only if you’re focusing on copy-paste and reading TechCrunch to see what you can quickly duplicate in India. Sure, we might not get the market caps the US firms get right away. But it will come to us, eventually. Is this piece a downer on the start-up excitement in India? I hope not. Our unicorns can and must happen — but should happen in original areas. Alibaba didn’t copy anybody — it started in China and rules the world, Skype didn’t copy anybody — it started in Estonia and rules the world. And that should be our inspiration. Can we build great, global internet companies out of India? Yes, for sure we can. But perhaps not in the way we’re doing so currently. Anyway, thought I’d pen this piece and see if it might trigger a few thoughts of your own — I’d love to hear those too! Do comment here and share at will. And happy new financial year! This article was written by Mahesh Murthy is a venture capitalist, marketer and entrepreneur. He tweets @maheshmurthy.